Lavender Baby Soap "It's a girl"
All Items are shipped via USPS. Shipping charges will be calculated by weight and shipped with in 5 business days. Due to the very nature of the natural personal care products we sell, we cannot accept returns. If we ship something incorrectly to you, of course these items should be returned to us, unused in re-sellable condition, and at our cost. All Silly Billy Goat Farm, LLC products are made with freshest goat milk from our sustainably raised heard, cruelty-free and cold-processed. Our soaps are made from scratch in small batches with the highest-quality vegetable based ingredients right here in the US. Goat milk soap is well known for its creamy lather and skin-loving properties. Goat milk is particularly nourishing because of capric-caprylic triglyceride, which helps form a barrier on the skin to help inhibit the loss of moisture. Goat milk also contains vitamins A, D and B6, as well lactic acid which is thought to contribute to skin smoothness. Lavender Baby Soap is perfect for babies, or those with sensitive skin. Due to its gentleness, this goat's milk soap is tolerated by any type of skin and is perfect for removing make up. It contains lipoproteins that help transport nutrients in to cells, it also gives the soap a soft, special texture. This limited ingredients olive oil formula are famous for its lather and cleansing properties with no irritation. 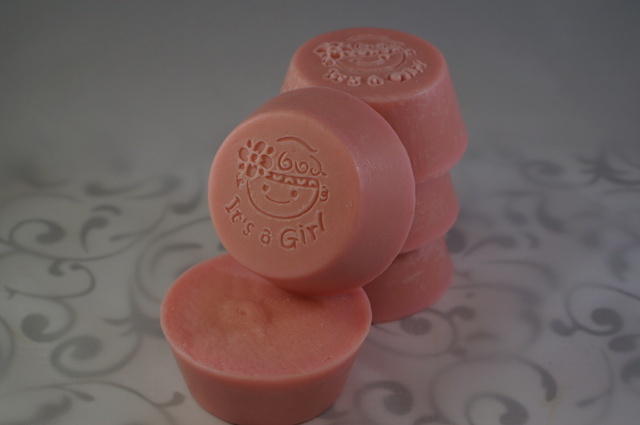 This soap is scented with Lavender Essential Oil and Stamped with cute "it's a girl" stamp. Perfect gift for a baby shower! *for large orders please allow 4-5 weeks due to soap curing time. Special pricing for orders over 10.